My blogs often highlight how nonprofit and business boards have similar challenges. Following I will highlight some business board challenges reported by William George, a Harvard professor, former board chair-CEO of Medtronic. 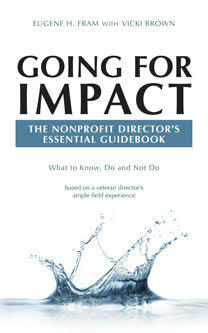 Then I will show how his experiences can be related to those of nonprofit board directors. * As usual, I will quote or briefly paraphrase William George’s insights through italics. Most nonprofit directors are independent ones. They typically have limited engagement with the (nonprofit) and its board, meeting six to eight times a year. Consequently, management’s knowledge of the organization’s information and data is superior . In the 21st century, nonprofit directors have an obligation to drill down in the organization to meet with key personnel beyond top management. In addition they need to better understand the “business” of the nonprofit through various media, discussions with management and talking with others operating in the field. Oftentimes the person ultimately identified to lead is just the most obvious leader, not the best long-term successor. In nonprofit organizations, selecting an internal candidate is often the “easy” selection. It reduces, search and moving costs, director time to introduce the new person to the community. Often the salary levels required are not as substantial as those required for a person coming from another organization. One organization with which I am familiar promoted the internal candidate. He was bright, articulate and knew the “business.” However, he was an individual contributor in relating to his staff, not an able and strategic leader. The organization stayed marginally stable during the recent succession, but it has remained marginally stable after the recession. He has returned to being a solo individual contributor in the organization. On the other hand, the board should … conduct detailed leadership-succession–planning sessions to review candidates and progression, ensuring that they have the necessary experiences to get them ready for the top jobs. While this type of planning may seem to beyond the abilities of most nonprofit organizations, the process may well be beneficial to most nonprofits. The staff then knows that the board will be looking internally when a top job becomes vacant. It may even motivate some of the organization’s best candidates to remain. When a crisis is thrust upon and organization, it is important that board members need to understand and trust each other. Only when they can have candid conversations will they ultimately reach a consensus that has far-reaching consensus that has positive and far-reaching implications for the (nonprofit). Trust is even more important when crises require directors to communicate at a distance. Data from several studies show that few nonprofits have robust crisis plans, beyond planning for temporary succession if the chief executive is incapacitated. Clearly, many nonprofits need to do more to prepare for all types of crises. But for many nonprofits, board time restrictions and budget problems are barriers. A nonprofit director who only fulfills the minimum requirements can be in a dangerous position. Nonprofit-independent directors must be fully engaged, do their best to learn the “business,” and stay connected between meetings. Old Chinese proverb: “A wise man learns from his own experience, the wiser man learns from the experience of others.” Nonprofit directors can do well by learning from William George’s experiences. * William George (2013), “Board governance depends on where you sit,” McKinsey Quarterly, February.